Whether your kids are just starting T-ball or headed to the Majors, we have the baseball practice gear you need to improve their game. Our training aids are designed to help establish the proper hitting mechanics, reinforce muscle memory, and make baseball practice more fun and efficient. The baseball practice gear we provide has been proven to increase batting averages and overall percentage of doubles, triples and home runs. No longer will your kids or players practice mistakes that lead to bad habits! Our training aids for baseball are innovative, engineered by professionals, and built to last. From our hitting stations and batting tees to our swing trainers and batting machines, we have everything you need with the expert knowledge to help you find exactly what you want. Order our baseball training equipment now to enjoy our free shipping on select orders, or give us a call at 877-300-0087 to talk with one of our experts right now. The Launch Angle Tee teaches players the proper swing approach angles that help them hit more doubles, triples, and home runs. FREE SHIPPING! The Rebel's Rack (and optional RACK BAT accessory) is a self-teaching rotational hitting aid that promotes the proper swing path and develops power. Eliminates common hitting flaws such as "casting" which results in a long, inefficient swing. Forces the hitter's upper body and arms into the proper position. FREE SHIPPING! The VeloPRO Velocity Load Harness is a resistance training system that unleashes performance potential for both hitters and pitchers. Developed by former Major League pitcher Jim Parque and used by several MLB teams. The BACKSPIN TEE is an inverted batting tee that will change the hitter's perspective to look at the bottom 2/3 of the ball. This results in back spin with cleanly struck line drive swings. FREE SHIPPING! The Launch Angle Tee Adapter turns your Tanner Tee (and several others) into a training aid that teaches the proper swing approach angles. FREE SHIPPING! The CagePro Travel Tee is a pro-style batting tee with a lighter, easier-to-transport base. An excellent combination of stability and portability. FREE SHIPPING! The CagePro Classic Tee is a professional-grade batting tee with a 10 pound cast iron base. FREE SHIPPING! The PROHITTER is a bat grip aid that helps produce quick hands, faster wrist turns, increasing bat speed and power. Watch any major league baseball game and you are bound to see pro hitters using this simple but effective batting aid. FREE SHIPPING! An effective swing trainer and batting aid that corrects common swing flaws that prevent players from reaching their full potential. It allows the player to "feel" the experience of using correct swing mechanics and taking a short, direct and inside path to the ball. FREE SHIPPING! The Insider Bat is a revolutionary baseball/softball muscle memory training tool that promotes proper grip, hand placement and proper swing path before, during and after contact is made. The unique design allows for only one way to make contact with the ball...the CORRECT way! FREE SHIPPING! The Advanced Skills Tee has a forward arm to eliminate "dipping" or uppercut type swings and a flexible outside barrier to eliminate "casting" and a looping swing. Developed by a high school coach, the AST is made of durable polyurethane to stand up to high bat speeds and team practices. FREE SHIPPING! Endorsed by Derek Jeter! The ideal baseball swing trainer for batters of all ages. The CATEGORY 4 is the new and improved Hurricane Model. FREE SHIPPING! The G Tee Batting Tee is a new high quality, heavy duty batting tee with an extremely durable yet portable design. This tee is a great choice for individual or team use. Comes with a 2 year warranty on all parts including rubber cup! FREE SHIPPING! The Impact Bat is a baseball training bat that reinforces the proper hand position at contact. It gives instant feedback and creates the proper muscle memory. Used with wiffle balls, tennis balls or other lite balls. Choose from 4 different sizes. FREE SHIPPING! The Camwood Weighted Training Bat is perfectly balanced to strengthen the forearms and create a better hand path to the ball, thus improving bat speed and power. Available in Youth and Adult sizes - choose from 8 different models. The Camwood Weighted Softball Training Bat is perfectly balanced to strengthen the forearms and create a better hand path to the ball, thus improving bat speed and power. Available in Youth and Adult sizes - choose from 7 different models. The Hands-n-Speed One Handed Trainer is great for tee work or soft toss, or even just with dry swings to strengthen the hands and develop the proper hand path to the ball. Choose from Adult or Youth model. The Camwood Sweet Spot Training Bat improves hand-eye coordination and teaches hitters to maximize power off the bat. The only tee that eliminates the 4 common problems of over-striding, lunging forward into the zone, dropping the bat head and dropping the back shoulder. A patented Angle Bar builds muscle memory to hit climbing line drives. A Front Setup Bar makes you stay back, turn on the ball and get your hands through the zone. The Hands Inside Trainer (H.I.T) is a batting tee attachment that promotes the proper hand path during the swing. 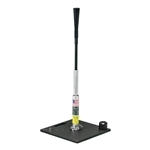 Turns virtually any batting tee into a swing trainer that teaches hitters to stay inside the ball.. FREE SHIPPING! The Quick Hitter trains a batter to read and react to the ball more effectively and with greater quickness by delivering the ball directly in the hitting zone. The PVTee is a durable, long-lasting batting tee designed to withstand the wear and tear of repetitive use by top players and coaches. Virtually impossible to tip over! FREE SHIPPING! The new JUGS T combines design elements from other leading batting tees to create a top performing, durable batting tee. FREE SHIPPING! Get Instant Feedback On Every Swing! Tee Stackers attach to your existing batting tee, and the unique design allows you to "stack" two or three balls on a hitting tee at the same time. Comes in a set of 2. FREE SHIPPING! The UtiliTee Batting Tee teaches multiple fundamental hitting skills that provide correct feedback with every swing. Designed with optional attachments to correct common hitting flaws and create proper muscle memory. FREE SHIPPING! The Power Drive Hitting Brace Trainer keeps your front arm in the perfect hitting position while keeping your hands in tight, inside the ball, for greater bat speed through the strike zone. Develops bat speed, power and strong, quick hands. FREE SHIPPING! 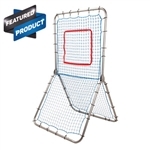 This Hitting Tee from Jugs Sports is a great value, and perfect for T-Ball or batting practice for all ages. Breaks down for easy storage, durable solid-rubber base. Heavy-duty steel reinforcement plate. The 5 Point Hitting Tee from Jugs Sports is perfect for baseball and softball hitting drills. Comes with 2 fully adjustable extension tubes. Lightweight and breaks down for easy transport. Teaches correct contact points for inside, middle, and outside pitches. Not just a great quality turf batting mat - it doubles as a training aid that provides instant feedback to prevent over-striding and other hitting deficiencies. Smaller, easily portable 5.5' x 7.5' size. FREE SHIPPING! Helps pitchers with their alignment and stride. Find where you are most comfortable, where you throw hardest, and where you get the most movement on your pitches. FREE SHIPPING! Target Base is a set of baseball bases that has the corner highlighted in orange to minimize foot, ankle, knee, leg, finger & wrist injuries along with teaching proper baserunning techniques. A Variable Weight Training Bat that dramatically improves hand-eye coordination and batter confidence. The Training Lace is the only flexible training weight available that can fit around any size baseball or softball bat. Its simple design allows the user to develop strength, power and endurance without sacrificing form. The ATEC Tuffy Single Batting Tee is an excellent pro style tee. Adjusts from 20"- 39" high. Home plate base, front of plate tee position. Made of high-strength polyurethane. The ultimate tool for practicing repetition. A heavy-duty batting tee that is smartly designed to never tip over. Its weighted base, spring coil action and untearable rubber top make this an excellent choice that will last for years. FREE SHIPPING! Gives a clean swish through the ball and lasts 10 times longer than traditional rubber tees. Made of durable polyurethane construction and comes with a 1 year warranty! FREE SHIPPING! The Pitch Location Mat will help any player better understand what they are being asked to do with specific pitches. Three pitch locations with arrows for right and left handed batters. Works great as a throw down plate with any of our batting tees. Muhl Kicker Training Bats are built specifically to hit live pitching, while improving eye hand coordination, building strength and improving swing mechanics! Endorsed by Leah O'Brien-Amico and Lance Berkman. Sliding steel element 'clicks' when the bat head is extended to teach a short, compact swing. FREE SHIPPING! The perfect combination one hand drill bat and warm up/strength builder. The Muhl Stub is a shorter Muhl (22") for one hand drills. It also comes with an screw on rubber coated weight that converts the Stub into a 53oz. warm up bat/strength builder. The Power Bag™ develops power hitting strength in the wrists and forearms. Strengthening the hands, wrists and forearms by using the Power Bag™ will decrease bat recoil and cause the ball to jump off of your bat. Muhl Balls help teach hitters to drive through ball contact and encourages strong hip rotation. A great training aid for developing power hitting strength in the wrist and forearms which is crucial for hitting the ball with authority. Available in packs of 3 with extras available. The Tripod Travel Tee offers any baseball player a top quality, sturdy and portable way to practice their swing just about anywhere. Flexible rubber ball holders provide Give and Stability. Adjustable height is 29" to 40". Comes with 2 Rubber Ball Holders, Base and Travel Bag.